Last-minute additions to the City of Kelowna’s 2018 budget include four new bylaw officers, several financial analysts and the quickened development of a Rutland park.Council on Monday approved a final budget that sets a municipal tax increase of three per cent, down from the 3.6 per cent that was provisionally set last December. About $2 million worth of unexpected revenues provided the wriggle room, which was seized by councillors not only to lower the tax rate but also to fund several new initiatives worth about $1 million. “I’m really happy to see where council has landed on this budget,” Mayor Colin Basran said. Kelowna’s municipal taxes are still below the level of most B.C. communities with populations in excess of 75,000, Basran said. The four new bylaw officers will work primarily to address social problems in the downtown area. “Not everybody who is on our streets is just down on their luck,” Basran said. “There are people doing street-level crimes who are causing problems.” Along with increased enforcement of bylaws and an enhanced policing effort, Basran said the city was committed to tackling social issues with a variety of “multi-faceted” approaches including the provision of housing. “Before we take any flak for trying to chase this problem away from one area of the community, we’re not,” Basran said. A three per cent tax hike means the owner of a typical single-family home that increased in value by 16 per cent to $641,000 will pay $1,990 in municipal taxes this year, about $60 more than last year.Larger-than-expected revenues from FortisBC, more proceeds from municipal investments and reduced borrowing costs allowed for the tax hike to be trimmed. Rutland Centennial Park will get a further upgrade, of nearly $500,000, for expansion of a playground and landscaping improvements. Several financial analysts will be added to the municipal staff. Coun. Gail Given, a member of the city’s audit committee, said the addition of the financial analysts will help ensure the city operates in the most cost-efficient way possible. 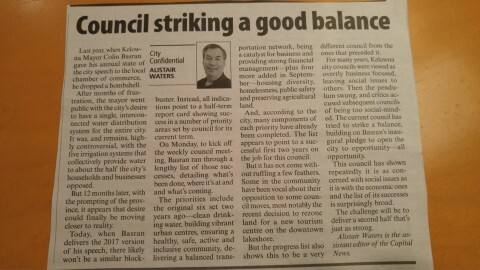 “Analysts equal savings, and it means the mistakes will be minimal, hopefully none,” said Coun. Maxine DeHart. Despite assurances nothing had chanced, council wanted certainty. They also wanted answers to several questions which were not forthcoming to their satisfaction. This article appeared in the Capital News. I thought it summarized the many city centre changes I have overseen in Kelowna in recent years. This article was published in the Okanagan Weekend paper on January 13, 2018. I was pleased to be recognized. I am really pleased that this new gas heater will warm everyone up at Stuart Park this winter. Thanks to our City staff for taking the initiative. A celebration was held Saturday for the unveiling of a new sign honouring Kelowna's Chinatown. An important part of Kelowna's often-overlooked history is now on display at the entrance to City Park. An unveiling celebration was held Saturday morning for a new sign, outlining the city's historic Chinatown and the contributions Chinese-Canadians have made to Kelowna. One of the speakers at Saturday's event was Tun Wong, a longtime Kelowna resident who was born in Chinatown, which used to be enclosed by Harvey and Leon avenues and Abbott and Water Streets. Wong's mother, who was born in China, moved to Kelowna as a child in 1929 and raised Wong and his 10 siblings in Chinatown. “I've tried for years to try and get a plaque or a sign to designate Kelowna's Chinatown to honour its past residents and the sufferings they went through,” Wong said Saturday. “This sign has far exceeded what I ever had in mind.” The last of the buildings in Kelowna's Chinatown were demolished in the 1970s, but the new sign will preserve this history for generations to come. The sign was designed by Arthur Lo, a retired Kelowna art teacher who sketched the design in 30 minutes during an Okanagan Chinese Canadian Association meeting in 2015. After two years of planning, the sign was finally installed Friday. The $32,000 sign was funded in equal parts by the Okanagan Chinese Canadian Association, the City of Kelowna through the federal government's Canada 150 grant and the Central Okanagan Foundation. Congratulations to Kelowna's newest recuits. These men and women are joining the Kelowna Fire Department. Today they participated in a ceremony marking the completion of their training. Each was awarded an official hat to mark the transition. Chief Whiting,and all in attendance, were proud to welcome them to the Kelowna Fire Department as both Fire Fighters and Dispatchers. It's been 102 days – and counting. That's how long the Central Okanagan Emergency Operations Centre has been up and running since floods first hit the region in early May. Kelowna Coun. Luke Stack, sitting in as acting mayor Monday, took the opportunity to thank those who have put in time at the EOC to ensure residents are safe. "They have been doing double duty, as many have been seconded from their regular daily work to take on additional responsibility within the EOC," said Stack. "These folks, for those who don't know, are doing their regular job, and manning the Emergency Operations Centre." The EOC was activated on May 5 after heavy rains the night before, combined with snowmelt, caused massive flooding throughout the region.The centre also pulled double duty last month after a wildfire in Okanagan Centre displaced hundreds and destroyed eight homes. Kelowna city manager Ron Mattiussi, who helps oversee the centre, says the real story within those walls is the fact it's been a regional approach. 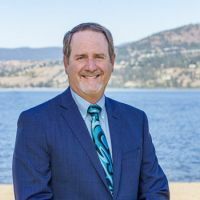 "If you walked into the EOC on any given day, there would be a communication person from Kelowna, or Westbank First Nation, or West Kelowna and an engineer from Peachland," said Mattiussi. "It really was the strength that we could call upon the whole region, and the whole region responded by sending people who were pretty busy, to fill in." Stack said everyone looks forward to the day when the EOC can be decommissioned, "and our lives can return to normal." While the flood danger has passed, the EOC will remain operational until cleanup is complete. (Castanet) Kelowna RCMP officers marched through downtown streets to their new headquarters, Tuesday. Dozens of passers-by stopped to take in the parade of Mounties in red serge, auxiliary constables, RCMP volunteers and civilian staff from the regional detachment area. "This is a really big deal for our community. Most importantly, this will allow the RCMP to do their jobs more efficiently and make our community safer," said Kelowna Mayor Colin Basran. "It's a very proud moment for myself and the other employees of our building to move into such a state of the art facility. This is the first opportunity I have been able to work in a new detachment," said said Supt. Brent Mundle. "The citizens of Kelowna and the city council have done an outstanding job at providing us with a professional building to do police services from. Pictured below L-R C/Supt. Brad Haugli; Councillor Maxine Dehart, District Commander Brenda Butterworth-Carr and Councillor Luke Stack. Kelowna is finally getting some much needed rental housing. We celebrated the opening of Asian Heritage Month in Kelowna last night at a celebration at the Okanagan College. The focus this year is on Japan. Featured performances by Alcin Ryuzen Ramos, Yaabiko Taiko and Sensei Chris Taneda (Karate). Pictured above are the many children in attendance singing along with Alcvin. Congratulations to Todd Cashin, of the City of Kelowna, for being recognized by his peers for the Mission Creek Restoration Project. This multi-partnership team is a great example of making a significant environmental improvement to this valued creek in Kelowna. The award is from the "Species and Ecosystems at Risk Local Government Working Group." In this picture Todd is being recognized by Deputy Mayor Mohinni Singh and all of Kelowna City Council. The Society is Hope is pleased to announce that the Provincial Government has funded the developemnt of building 3 under the Federal Infrastructure Program. This project will add 47 new units of senior rental housing to Kelowna. It will complete the Apple Valley complex. Construction will begin in Spring 2017 and complete in Spring 2018. Each Year the City offers Schools the opportunity to conduct tours of City Hall. Typically these tours consist of grade 3 children. They get an opportunity to learn about municipal government and the job it does on their behalf. I have been doing these tours for many years. I always enjoy the interaction with the children. They often bring prepared questions to challenge us! The children really enjoy meeting the Mayor on their visit. In this picture the children are learning about the "Spririt of Kelowna" wall. This wall celebrates Kelowna's 100th birthday which took place in 1905.